Prime Minister Shinzo Abe may be keen to tout Japan’s untapped labor force, but will he go beyond the rhetoric? I am at a local center, where residents may to socialize and host events. A group of women sits before me. We have been discussing their interests and aspirations for an hour. I look around at them, and see engaging and sociable individuals. They all share two things in common: each went to university and each quit their jobs after having a child. Although it is all well and good to choose family over career, the predictability of the career paths of these women is unsettling. Here, they treat it as part of a standard expectation. 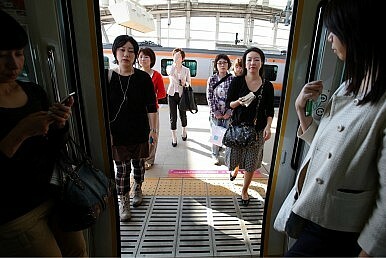 A working lifestyle in Japan is not compatible with motherhood, or so these women have been led to believe. The recognition of working women as a strong economic force may not seem like a novel idea to most developed nations. For Japan, it brings to light an issue of women’s rights long swept under the carpet. Why has it taken so long for the government to explicitly and actively acknowledge the problem of working women in Japan? It certainly is not due to lack of evidence. The year 1999 saw the introduction of The Basic Law for a Gender-equal Society Act, which stipulated that the state would be responsible “for the comprehensive formulation and implementation of policies related to promotion of a Gender-equal Society.” However, by government estimates in 2011—over a decade later – only 6.2 percent of managerial roles in private firms were allocated to females. The IMF states that female employment rates are currently 25 percent lower than males, giving Japan one of the lowest rates of female employment in all developed countries. Half of all university graduates in Japan are women. Despite this, Kyodo News Agency reports that a recent survey suggests that Japanese women themselves have internalized the image of the stay-at-home mother, with one in three women wishing to become housewives after marriage. Many believe that Abe's statements on the virtues of “Womenomics” may help change the status quo, leading to substantial economic change and clearer signs of gender equality. Whilst the IMF has stated that employing more women could increase Japan's GDP by up to 5 percent, there are plenty of reasons to feel skeptical about the governments recent feminist slant. A good place to begin looking is the inner workings of parliament itself. Are they practicing what they preach? Since the beginning of Abe's term, the percentage of female members of the Lower House of the Japanese Diet has fallen to 8 percent. Only two of his 18 cabinet members are women. This leaves Japan 124th out of 188 countries surveyed by the Inter-Parliamentary Union, below developing countries such as Mali, and far behind China and Korea, ranking 54th and 88th respectively. Under-representation is not confined to governance on a national level: as few as 0.8% of mayors in Japan were women in 2011. Women remain noticeably absent from the political sphere, having little direct impact on public policy and decision-making processes.